It feels like forever since I’ve had so much fun with a book! Callie and the rest of the crew of The White Raven exist far out on the edge of the solar system, doing salvage runs and acting as the closest thing to a police force. Then on a routine salvage mission, they find a centuries old “Goldilocks ship,” with one of the original inhabitants still in cryo-sleep. When Dr. Elena Oh wakes up, she proclaims that she’s made first contact with an alien species and that the rest of her crew is in need of rescue. Humanity’s already made contact with aliens… but is this an entirely new species? And how did Elena get back to our solar system anyway? As the questions pile up, the crew of The White Raven is set to uncover a centuries long conspiracy. I love science fiction books with good aliens, and The Wrong Stars 100% delivers. The aliens humanity’s made contact with while Elena’s been gone are called the Liars. Because they lie. About everything. Every single group of Liar’s humanity’s met has spun wildly different stories about everything from the origins of their species to what day of the week it is or what their names are. They’ll never admit they’re lying, even when it’s completely obvious, but will instead say another group of Liars is lying, blame it on translation errors, or just insist that they don’t see anything wrong with the piece of technology that’s just exploded. In short, the Liars are an incredibly original alien culture that also manages to be hilarious. It also means that it’s impossible to get any straight answers out of them. Do they know anything about what happened with Elena? Who can tell! And you definitely can’t trust any answer they give. And man, does the crew of The White Raven start wanting answers. The pacing is quite snappy, and the narrative never drags. From the get go, there’s plenty of action and excitement to be had. On the whole, The Wrong Stars is more focused on plot shenanigans than character development, but the cast still managed to be surprisingly memorable. Callie and Elena are the clear leads, and the story switches between their POV sections. However, I think my favorite character might be the ship’s mechanic, Ashok, who’s a post-human obsessed with transforming himself into a cyborg. While the romance subplot between Callie and Elena possibly suffers from the focus on plot and the quick pacing, I never found it bothersome. All in all, I found the cast wholly enjoyable. Also, there’s so many queer characters! Going in, I knew that there was a f/f romance subplot between Callie and Elena (this was part of why I picked it up), but I didn’t know that Callie was demisexual. There’s also a supporting character who’s ace, which made me so happy, and there’s trans and nonbinary supporting characters as well. I haven’t seen The Wrong Stars popping up on any lists for queer sci-fi, and that’s a shame. 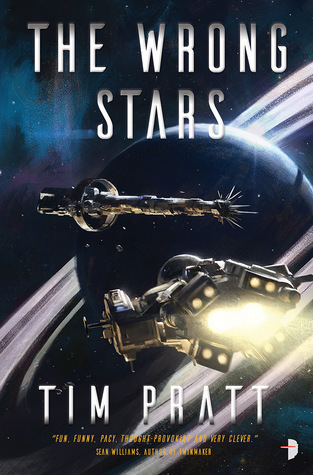 If you’re looking for a fun, well written space opera with queer characters, The Wrong Stars is right up there with A Long Way to a Small, Angry Planet. Anyway, I enjoyed the heck out of The Wrong Stars. It’s a refreshingly fun, hard to put down book. I strongly recommend it, and I can’t wait for a sequel! I wouldn’t put it in the genre of “humorous sci-fi” (Douglas Adams and the like), but it is light-hearted. Have you ever read Scalzi? There’s a bit of a similar feel. Hadn’t heard of this before and sounds great. The Liars sound vaguely familiar, but I’m not sure why I’d think that. Maybe I’m mixing them up with those weird aliens in Ancillary that always say and do odd things. Mh, I ended up not being too enamored by it. Characters are too similar with the two leads being the most boring ones, the romance too typical, the plot with no real surprises and an imbalance between “let’s just have fun with some quirky scifi” and “have some horrible tragedies mixed in”. And the writing itself was also a bit so~so. Fun enough, but could have been better, I think. I did think the characterization was closer to “functional” than “wonderful,” but I was able to enjoy it anyway. Sorry you didn’t have the same experience! Ah, don’t get me wrong, I still enjoyed it. But there’s some things – like the end with the pirates? That felt just super-rushed. They didn’t ask for any security – like that the White Raven accompanies them, or that one of their crew plays hostage – and then they super-conveniently also left no real defense behind. That level of storytelling is just … not good enough, I think. You can make up for it with characters, sometimes, but like you say they aren’t that outstanding either. I remember seeing this on NetGalley (which I’ve been steadfastly ignoring because I need to finish the ARCs I’ve got and get on with my Subjective Chaos reading!) – but you have totally convinced me to add it to my wishlist. This sounds great! I think you’d like it! Also, I SHOULD be ignoring Netgalley. My TBR pile stares at me pathetically whenever I request another ARC.